All photos and text copyright dave garoutte unless otherwise stated and may be used with permission only. The 'Verdict' was conceived of to be a rolling piece of art. I wanted to try out some ideas I had for frame construction methods as well as end up with an aesthetically interesting yet functional trials bike that I could compete on as an amateur. I foolishly let my employee at the time, Dave Arbogast, compete with it in the 'pro' class until I realized that I was never going to get to ride it because he was always out practicing. This forced me to make a second version: the 'Terranaught' for him to have. The Verdict uses a 24" front wheel which was the style at the time, but we changed the geometry for the Terranaught to use a 20" front wheel. The second frame also used thinner sheet aluminum to save a little weight. The sheet aluminum for the frame was hand hammerred over a hand-carved wooden buck and to achieve its unique shape. The rear stays were formed over a metal pattern. The fork blades were 'stamped' in a hydraulic press with some crude dies that I made. 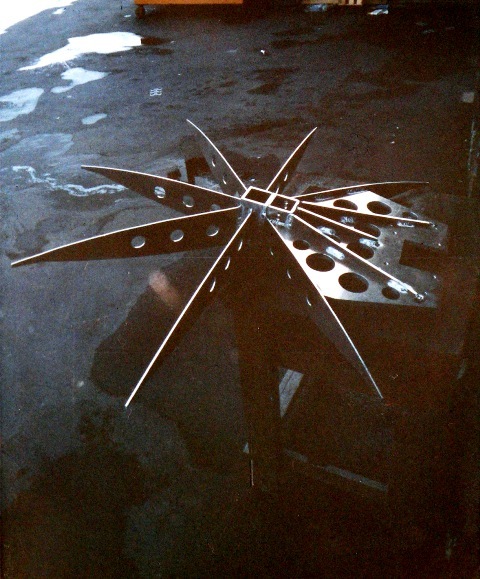 The various parts were machined, lightened, fitted and TIG welded together and then heat-treated in Charlie Cunningham's home-built frame oven. There are several brands of production 'monocoque' frames being made now, which were inspired by, and a direct evolution of the technique used to build this frame. Some of the features of this frame: Fully hand-formed and heat-treated 6061 frame and fork. Internally lightened and gusseted head tube. Fully integrated skid plate. Special one-off toggle brakes. Hand bent 4130 handlebars. 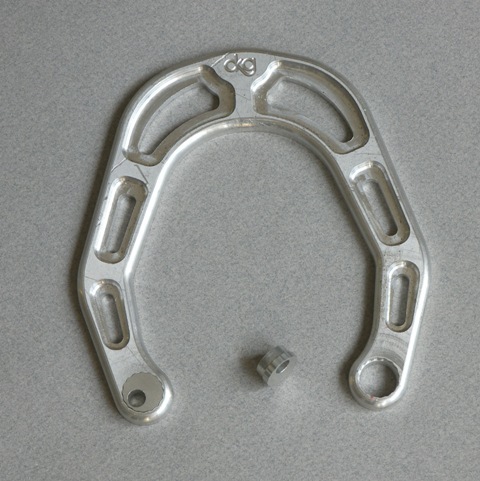 Special open-sided toe clips for easy entry and exit. DKG 135 mm Trials Crank Arms. Aluminum unified seat and seatpost (not comfy). All aluminum unified fork and stem with upper connection to the steerer (this was years before double clamp forks on bicycles). 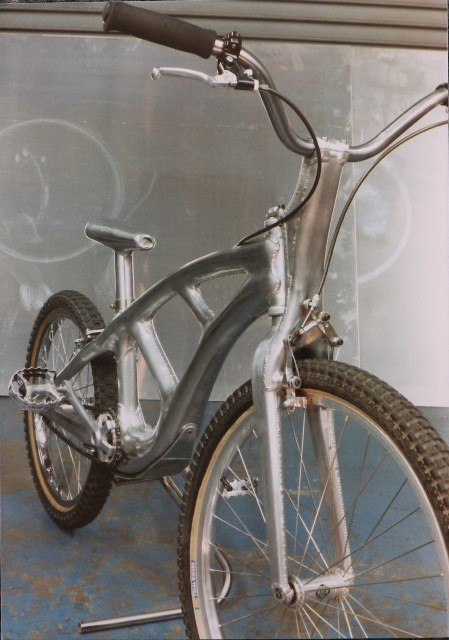 For many years I had been working together with Mert Lawwill on his racing motorcycle projects, when he approached me to do the production development for a bike he had contracted to design for Gary Fisher Bicycles, which became the RS-1. This bike was to use his four-link rear suspension and was one of the first effective, fully suspended mountain bikes. 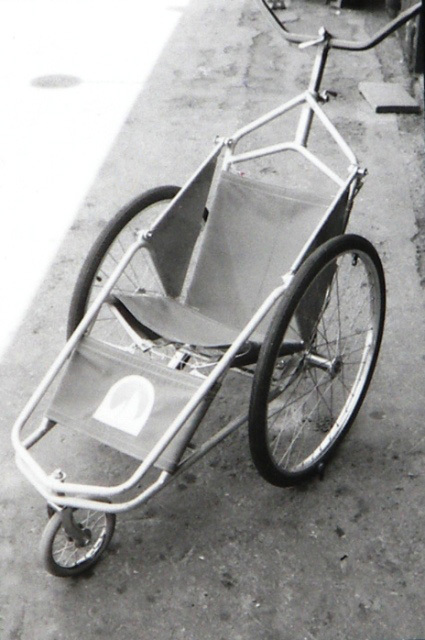 Mert had done the basic geometry development on a steel-tube bike and needed it turned into a produceable product. We went from his mockup to drawings to building the prototype. 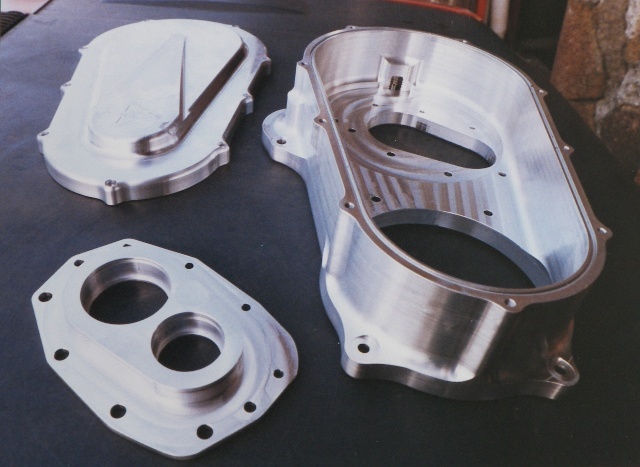 After some fine-tuning of the design, we went to full production of the CNC machined parts. 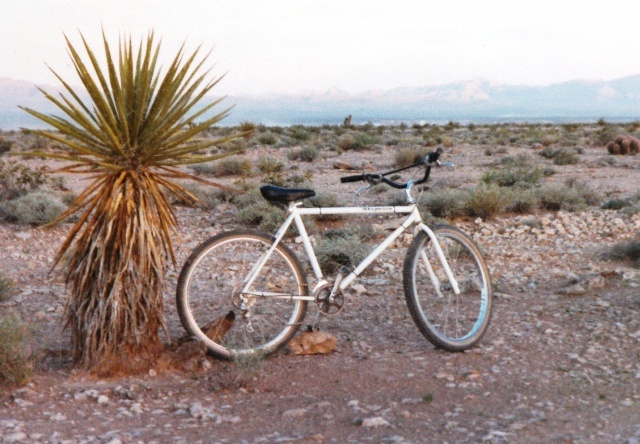 The Trailmaster was certainly one of the first purpose-built production mountain bikes, after the Breezer, Ritchey-built Mountain Bikes and the Pro-Cruiser. The photo is of frame #1 taken at the Mint 400 near Las Vegas. One of the reasons I started DKG was to build this frame. Don Koski was a longtime motorcycling friend from high school and was one of the people I would go 'bombing' with on Mt. Tamalpais. 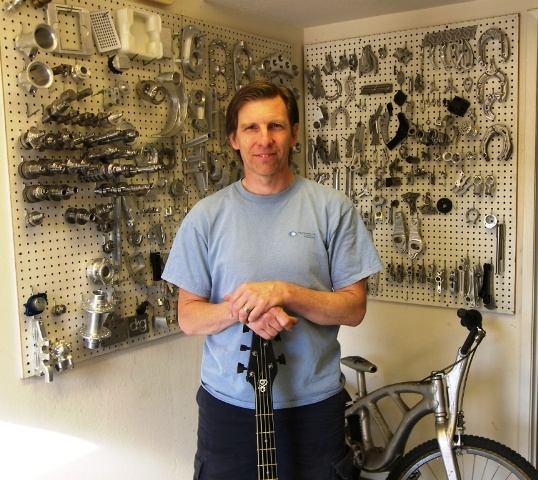 His family owned Viking Ventures bike shop and Don and Erik were putting together the first mountain bike parts catalog. They wanted their own product line as well, and commissioned DKG to make the Trailmaster frames. We built the frame, fork and sub-assembly fixtures and only about 100 frame sets before politics ended the relationship. These frames featured internally butted head tubes and bottom bracket shells, 4130 tubing, TIG welded construction, an original rear dropout design that has been much copied since. The 'Koski' fork was based on a design I had done during the Trailmaster period, but didn't have the capital to produce myself. This was a fun, but tricky part. Their prototype was a fabricated part, but Moots wanted a billet titanium version for their production frame. Marc Horwitz, an old junior high school friend and longtime bikie and Mt. 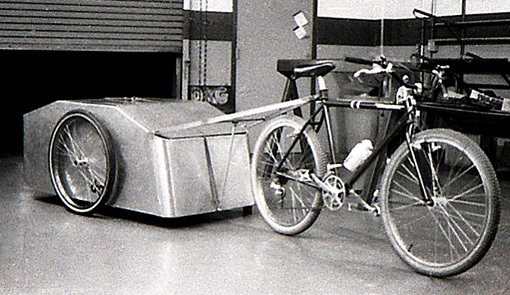 Tam Bomber, asked me to build him an insulated trailer for his bicycle so he could deliver product for Wildwood Natural Foods in Fairfax (without using a car) to the various grocery stores and delis around Marin. I think we made two of these which were in service for many years. The frame is square steel tubing with an aluminum skin. The angled top surfaces are doors. Insulating panels fill the space between the tubes and drop-in drawers hold layers of food. Cantilever brakes (and V-brakes) flex their mounting posts and seat stays causing squeal and mushiness due to the inherent lack of rigidity in the mounting system. This device pretty much eliminated the problem. This was probably the original aftermarket brake brace, but still the only one to address the issue of varying mounting stud spacing in a balanced, mechanically positive way. The C-beam shaped main plate held two indexing eccentrics that allowed you to adjust the mounting hole spacing without any slipping under load. We actually recommended that you rotate the buttons to pre-load the studs in the opposite direction of the flex to minimize overall stress and movement. Interestingly enough, I first met Ross Shafer when I went by Salsa to measure some frames and ask about general stud spacing requirements for the soon to be StrongArm. 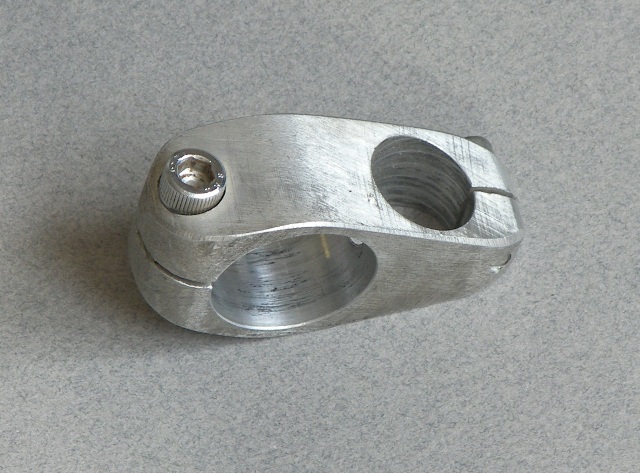 Developed with Ross Shafer of Salsa Cycles fame, this was our second style of seat post clamp. 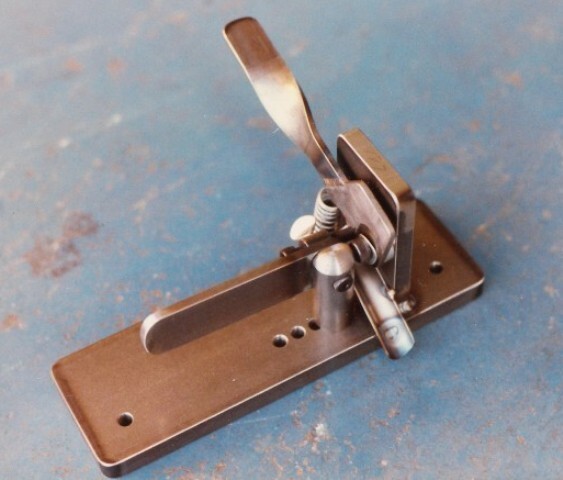 It greatly improved on another cam lever design, making this a viable product. The clamp also has roots in a clamp we were doing for Charlie Cunningham of WTB. There are about a million copies now, but we still make and sell the original. This is literally the original Mini Mount. Even us CNC guys use band saws and disc sanders sometimes. There was enough interest on the Mt. Tam Wednesday night ride that I decided to turn it in to a product. In fact one night, Steve 'Gravy' Gravenites gave me the initial encouragement for me to develop this part. 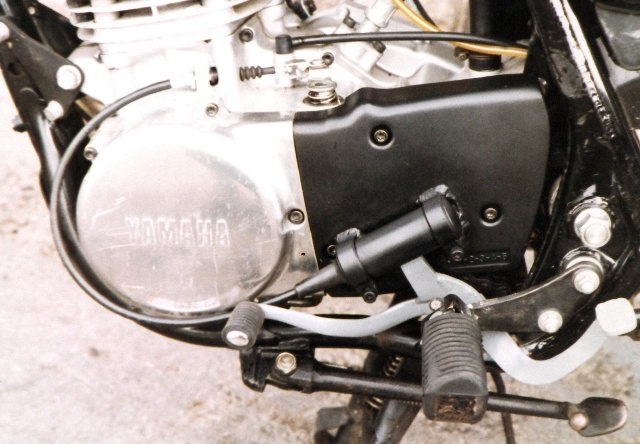 One of the ten kits was for a Yamaha TT500 road racer and another was adapted to a Yamaha RD400 engine for Smith Machine and Quandry. Bill Smith, the owner asked Doug Draper and I to race his bike in the 1980 Ontario 6-hour. We finished 7th overall, First in the 500 class and beat all of the 750's. We calculated the top speed at this race at over 150mph.?? We were passing 1000's at the end of the 'mile-long' straightaway as well as the turns! These frame kits were quite successful, winning many races and a championship or two for several of their pilots including myself. Some features included: Oversized (for the time) tubing in a straight load path from head tube to swingarm pivot. Tapered roller head bearings. Formed double tapered swingarm with tapered roller bearing pivots. Short (51") wheelbase for quick handling. Light weight (my own bike weighed 225 lb. without gas). DKG rear floating disc brake kit optional. This was another Mert Lawwill project, in this case for the Harley-Davidson race team. I was given a free hand to build a HD 1000 based road racer for the AMA Battle of the Twins professional race series. The bike was 'raced' by Jay Springsteen in 19-- at Daytona Motor Speedway in Florida. I named it the Land Shark, but HD didn't like it. 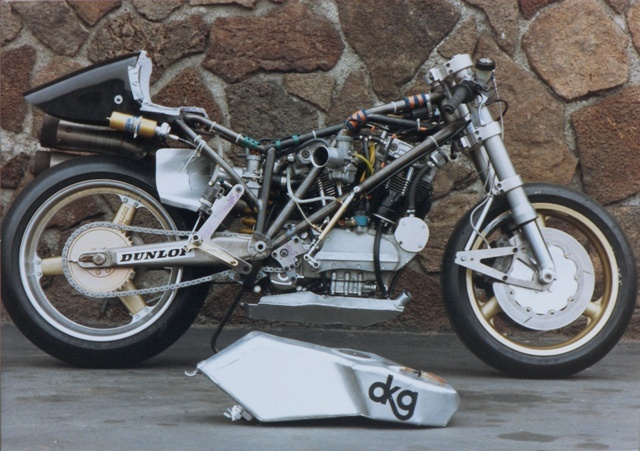 The chassis was built around an XR750 dirt-track engine which was used for the initial testing. 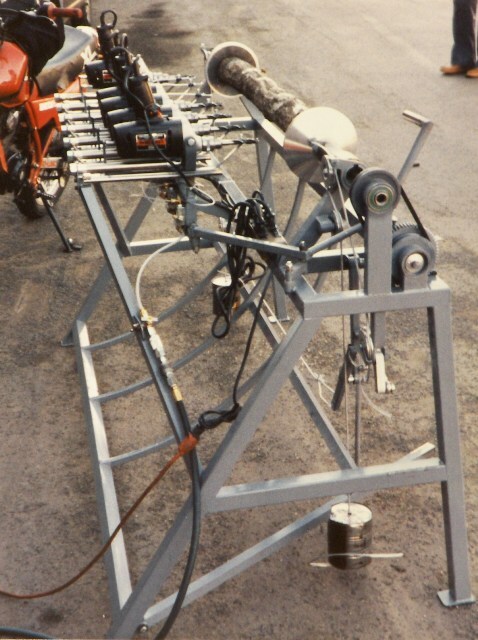 When it was finished, I rode the bike around the block once, then crated it up for shipping to Daytona for the test. Jay and Chris Church were there to try the bike out as well as the current factory bike; "Lucifer's Hammer'. I took the first couple of laps on the Land Shark to make sure it wasn't going to pitch anyone down the road. After the test, Chris decided to race the old bike and Jay decided he liked mine better. When we got back to the shop, we were given an old 1000cc motor to mount and finish fitting for the race. 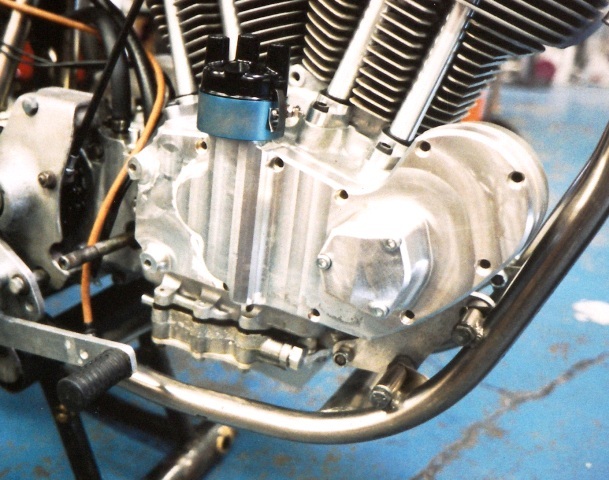 New pipes, shifter, oil tank and carburetors were made or mounted. Then off to Daytona again where the fiasco began. For most of speed week we were having oiling problems that turned out to be caused by the worn out engine. Jay would go out for a test session and come in at the end of the second lap with oil all over the bike. Incredibly, even with oil on his back tire, his lap times were within a second of the times that eventually won the race. On the day before the qualifying race, the the motor toasted a connecting rod and we spent all night rebuilding the motor. That was when we realized how worn out it was. The piston had smacked the head when the rod bearing went, crushing the lands onto the rings, and I had to spend two hours carefully removing the old rings because they didn't even have new rings for us to use! Meanwhile, Mert was busy rebuilding the crankshaft. Things were looking good for the next day when Jay went out for the warmup lap of the qualifying race. Much to our dismay, he coasted into the pits with a broken transmission. Race over before it began! This ended my involvement with the bike and I don't think they ever raced it again, possibly because of internal politics?? Some features: Magnesium triple clamps. Oversized upside-down forks (modified motocross forks and as far as I know, the first use of upside down forks on a road racer). Oversized direct-path frame tubes. 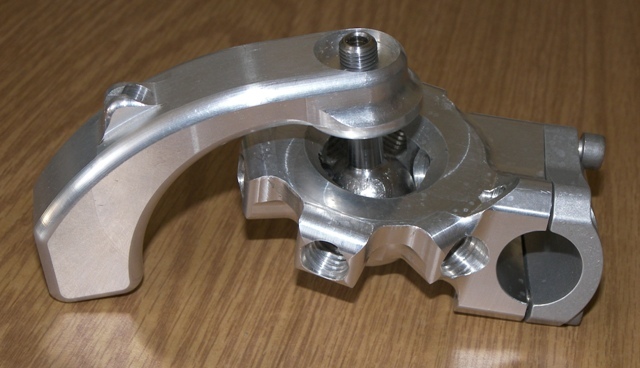 Outrigger aluminum swingarm with spherical roller bearing pivots. Short ( 55") wheelbase. Weight appx. 280 lbs (this was 40 lb. 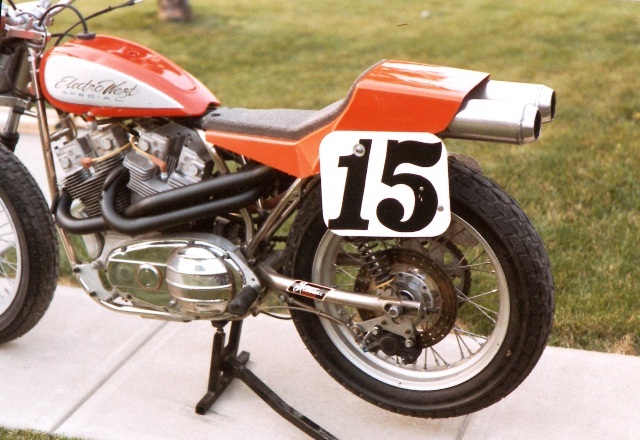 lighter than 'Lucifer's Hammer', the official Harley entry ridden by Chris Church). Anti-dive front brakes. Under slung oil tank. Now this was a project! It started (as most of Mert's projects do) as an idea and a basic design. First we took the basic geometry of the motorcycle frame that Mert wanted to build. Then we determined some fixed reference points that we could use as a base for the electronic model that we needed to build. One of the primary concerns with this design was to keep the rear drive belt tension as constant as possible. These rubber toothed belts are not happy with either tight or loose conditions and we wanted to avoid using a belt tensioner. I built a rudimentary model in Solidworks and started experimenting with large and small geometry changes in the four-bar linkages. When the belt issues were acceptable, I started designing the actual shapes of the upper and lower swingarms, taking into account looks and clearance issues. One of the huge advantages of solid modeling is that you can visualize the actual motion of the assembly by grabbing a part with the mouse and moving it through its range. 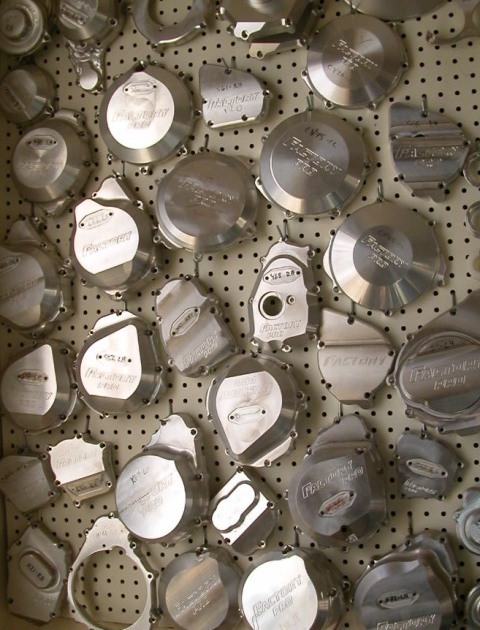 Collisions and problems can be seen and removed virtually before any physical metal is formed or cut. 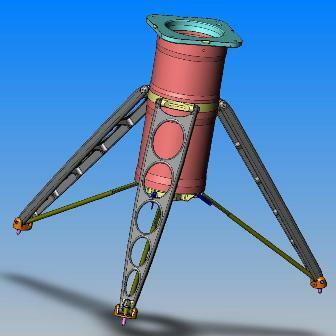 During the modeling process, producibility must be taken into account so that when the design is done, the parts can actually be made economically. That way the transition from electronic to metal versions are relatively trouble-free. 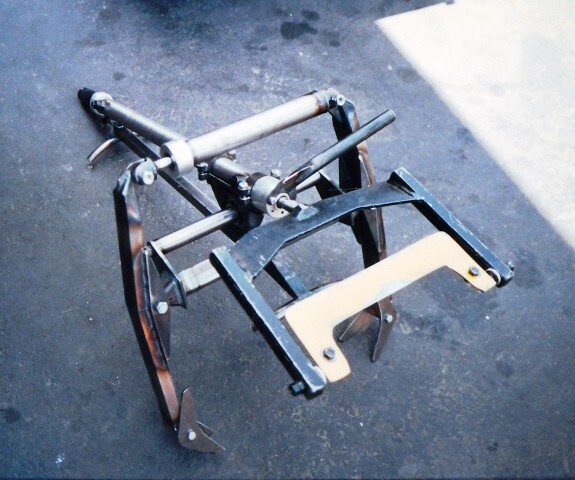 The parts we manufactured for this project included the swingarm pivot clamshells(as used on the road racer frame), most of the swingarm parts, the shock linkage and the rear axle links. 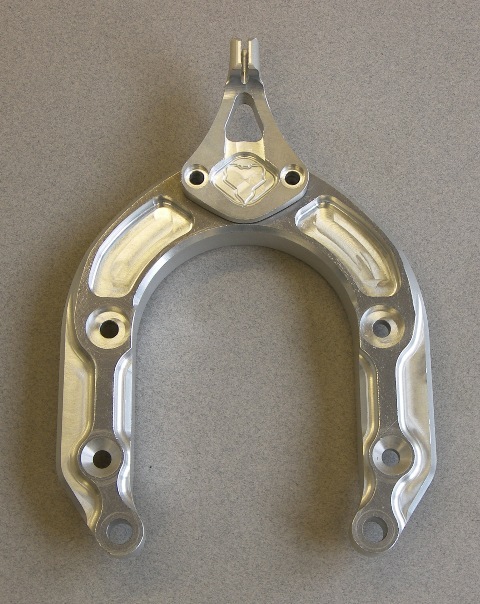 The next batch of frames will have the large swingarm parts cast, incorporating several machined parts into a single casting. This will save a huge amount of machining and wasted material, as well as greatly simplifying construction. 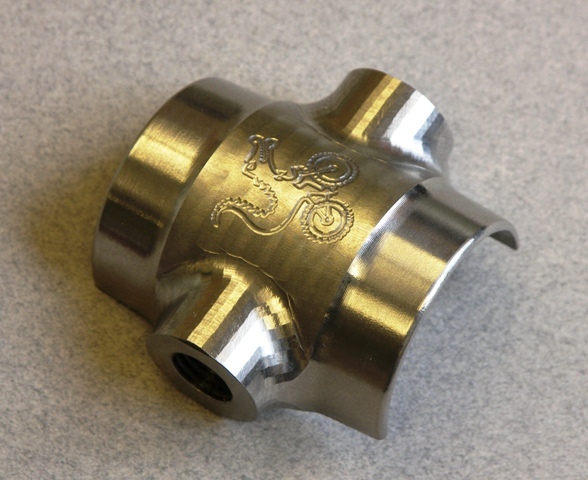 The changes to convert from machining to casting were also done in Solidworks. 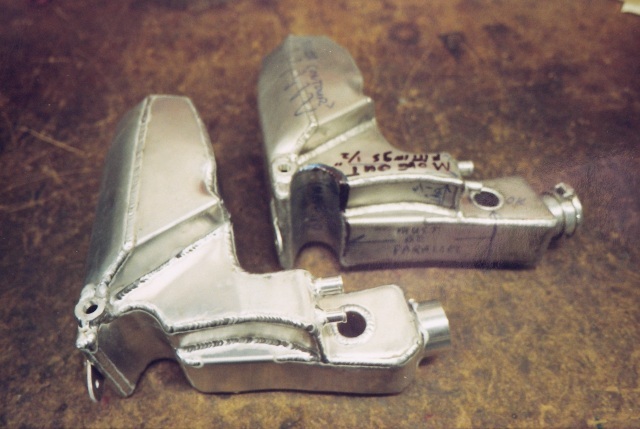 We were able to supply solid models of the parts we wanted to have cast to the foundry. 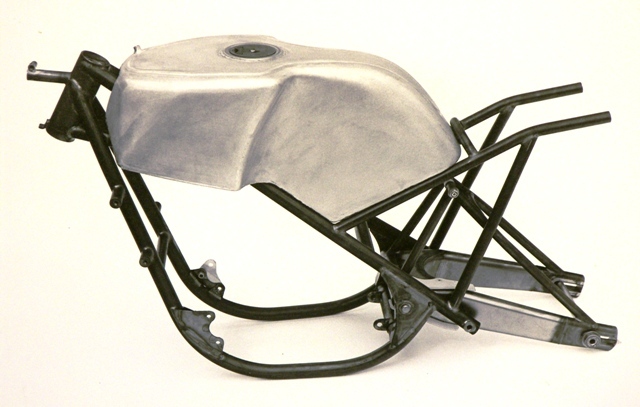 This was an evolution of the stock cover that saved half the weight over the stock aluminum XR750 casting. We were able to use the factory blueprint for the critical dimensions. This version incorporates a trochoidal scavenge oil pump (the lump sticking out with three screws). These were made for dirt-track use. 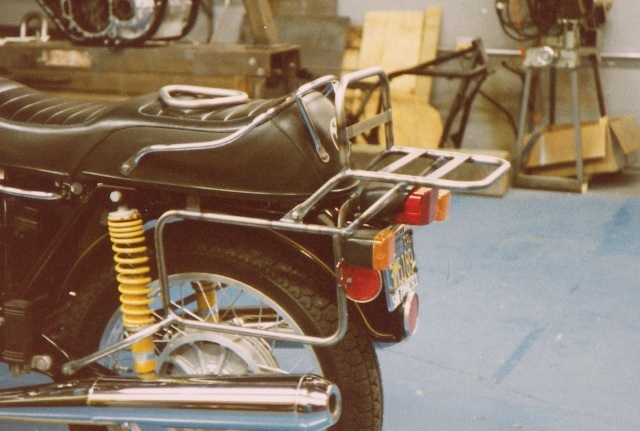 This is one of several fabricated solutions for customers missing a hand, to allow them to ride their motorcycles. Some of these ideas went into the Lawwill Hand (see below). This simple mechanism allowed the shift lever to also disengage the cluth. The 'pod' had a device that pulled the cable on the upshift and pushed the housing on the downshift. Here is one of a bunch of motorcycle oil and gas tanks from the fabrication days. This is one of the larger hunks of aluminum we have worked on: 4" x 11" x 19" ; over 80 lbs. before machining. 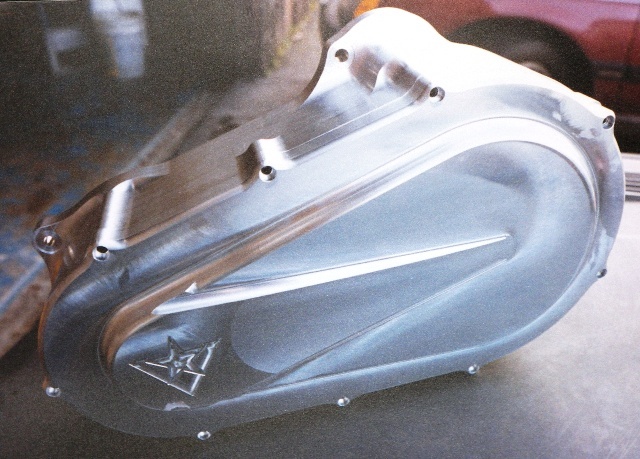 We have been designing, reverse engineering, and machining motorcyle engine side covers for Marc Salvisberg's Factory Pro Tuning since 1990 or so. Later, we came up with the idea of incorporating the plastic frame slider (which we were looking at mounting on the frame) onto the covers as a refinement of Factory's stainless steel sliders on one of their early covers. We have developed several lines of motorcycle products with Marc over the years, currently expanding their line of Velocity Stacks and Shift Cams as new models of bikes come on the market. My friend Bryan Hilton designed this product for his BMW shop to sell. 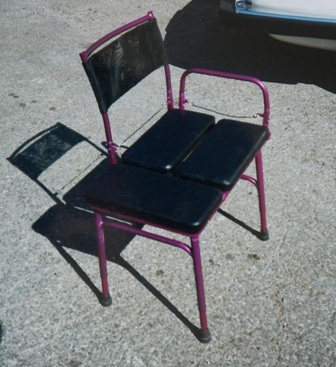 It was one of the three products that I had lined up to manufacture when I started DKG. One of many racing exhaust systems I have fabricated. This one is the prodution version of a prototye that I made for Mert Lawwill. It may be the first under the seat exhaust system. This is a situation where holding the blanks is the hardest part of the job. Material needed to be left to grip on for the following operations. This makes the order of machining very important. This shows four of the six operations. A good friend of Mert's, Chris Draayer, was an avid motorcycle rider and racer who had lost his hand in a professional dirt-track racing accident. Mert wanted to make him something to use instead of his 'claw' to let him ride more safely. The claw didn't hold very securely, but neither did it release when you wanted it to. Not a good combination. I had done some development for another customer some time before, who had a similar limitation. Mert and I improved on the original design and he made a prototype which Chris used for several years. When Chris asked for another one, we decided there might be a need for such a device, so I refined the design and turned it into a produceable product that would work for both bicycles and motorcycles as well as anything with handlebars. Mert has sold more than 60 units to individuals and prosthetics fitters around the country. More photos and some testimonials are viewable at mertlawwill.com . These sort of enabling devices are always gratifying to do. Being able to help overcome some physical limitations and help people do what they want to do is a personal joy. This is my baby. 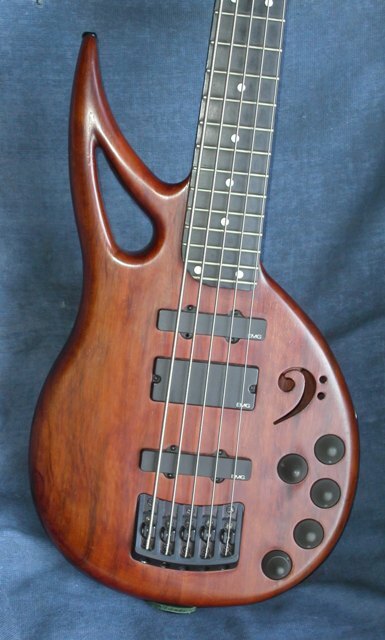 I had been 'playing at playing' bass guitar for a while when I foolishly decided to make one of my own. The basic idea was to make a light weight 5-string for fun. 100 hrs later, I'm not so sure. The body is four pieces of Alerce (a South American redwood) and the maple neck with ebony fingerboard is a modified kit neck from Carvin. The body is semi-hollow, having been fully CNCd inside and out on my FADAL. After gluing and sanding, a tung oil finish was applied. The anodized aluminum bridge is my own design, and will end up a product someday. So are the knobs. The pickups are EMG. The battery box pivots out by unscrewing a bicycle shifter bail. For lap playing, I have a thin aluminum knee hook strut that is quickly attached to the body. Weight : 8 1/2 lbs. with strap and batteries. Shahin walked into my shop one day with a funkily fabricated telecope tripod that he had just had made by another shop. He asked me if I could do something better. I said I would if he gave me free rein to make the best product on the market and he agreed. I was working for Kosman Specialties, and the owner, Sandy Kosman, who was running 10K's for fun, wanted a way to take his son Seth with him on his runs. I designed and built this three wheeled 'stroller' with handlebars and a castering front wheel for them. The frame is aluminum tubing. 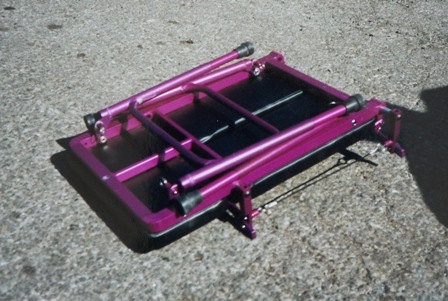 The back folds down and the wheels are quick release (no tools required) so the whole thing can fit in a car trunk. Sandy and Seth used this device in many events over the next year or so. Then, a while later, the Baby Jogger hit the scene. . . Coincidence??? Rube Goldberg beware! 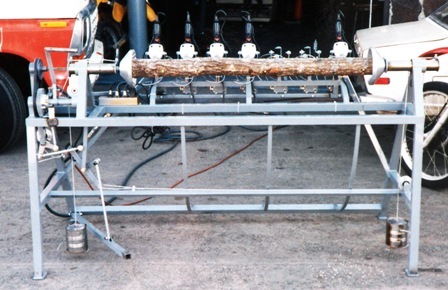 This was a semi-automatic tool for drilling holes into oak logs which then were filled with Shiitake mushroom spores. The resulting mushrooms are then cooked and eaten. Yum ! 1-First you step on the pedal to open the end cones. --2-place a new log between the cones and release the pedal to grab it. --3-Push the lever forward to start the 6-10 pneumatically actuated electric drills which feed in and then retract themselves. --4-Pull the lever back to rotate the log 90 degrees. --5- Repeat 3 and 4 three more times. --6-Step on the pedal to release the drilled log into the chute which ejects it out the back. --Repeat 2 thru 6 a million times. This was an emergency rescue job. Don and Erik Koski had designed this snow vehicle and needed it made. The problem was they wanted it done for the Anaheim?? Bicycle dealer show which was only a week away. That's a lot of programming, machining, fabricating and welding! Around 80 hrs., and my head machinist Craig Hildebrand and I worked the last 24 hrs straight to finish it on time. Erik designed the front end and most of the frame. I refined a few details to make it buildable. 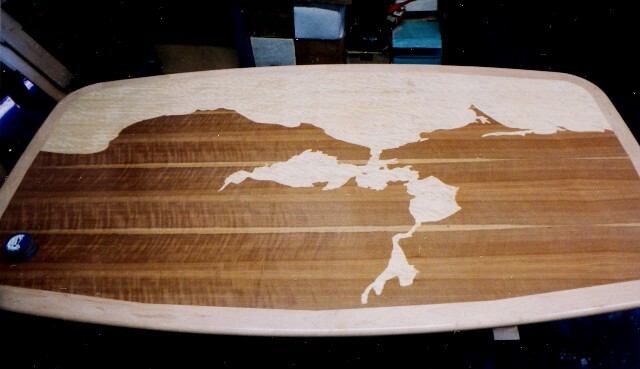 This project was for a customer who water skied semi-professionally and shall remain unnamed. 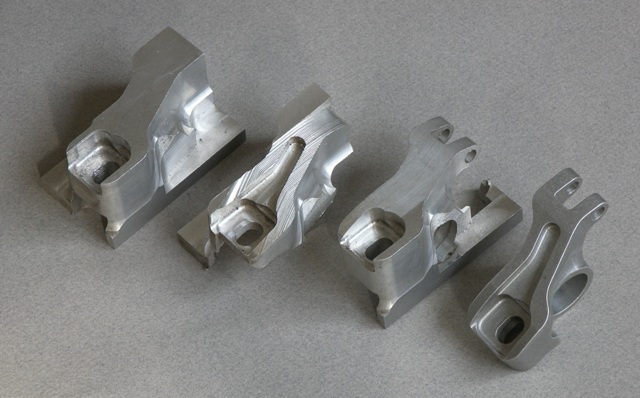 He required an improved and fully machined replacement for the stamped binding plates on his skis. He also wanted a more accurate and micro-adjustable fin and fin mount. The idea was to increase consistency and ease of adjusatbility. I was given a free hand as long as the parts fit certain parameters. The binding plates were fairly straight forward, although holding thin parts for machining is always a challenge. The front binding accomodates a plastic water ski boot and the rear uses the normal rubber boot. We were able to lower his feet by a quarter inch or so by milling a window in the plates, lowering his contact point and increasing feel. A slot was milled exactly in the center of the ski to accept the fin mount. The fin mount has front and rear vertical adjustments and a front to back adjustment. Tightening the screws causes two wedges to clamp the fin rigidly to the mount. The wing has two identical parts that screw together to clamp at any angle (using the angle indicator), to adjust the down force. This used to be done with precision angle blocks on the standard fin..
During my political period I was on the board of the BARTC as a bicycling advocate. We were using some scummy table for our meetings and I volunteered to make them something special. I talked my friend Jim Hinkle of Woodline Design into helping and to let me use his shop to do the major milling. I hand cut a full-scale aluminum template and then cut the veneer with an exacto knife. By the way, it's a map of the san Francisco Bay Area. This is an early version of a device for cutting silver or gold wire into short, precisely equal lengths. The wire bits are then melted to form spheres of equal size (the surface tension of the molten metal draws the wire blob into a nearly perfect sphere) which are then used to make jewelry. The longer the wire, the larger the granule. The final version was mostly CNC'ed aluminum. I have done a fair amount of fabricating for the local special effects industry. There were three shops within 5 miles of dkg. This horrible photo is actually the inside frame of the disc hull for the Next Generation TV series, made for ILM. This strange contraption is used for removing the bark from logs to make log cabins (yes, really). This hand operated device has two pneumatic cylinders controlled by a lever on the handle. You pull the lever and the side arms grip the log as the self-aligning blade (yellow) peels off a foot-long section of bark. Release, move, do it again, etc. Hey, if you have any comments or feedback or requests, call or drop me an e-mail... Dave G.